Hmmm, this is like asking me which piano-based musician I like better: Ben Folds or Tori Amos. One is a flame-haired, kooky, piano goddess and the other is a charismatic, geek, rocker. I like them both for very different reasons. I like that they speak English in London, or at least some variation of English. Despite the fact that there are no trash cans downtown, London seemed cleaner than Paris. I found the London tube to be easier to navigate and prettier than the Paris Metro, which was grimier and not as well labeled. I also disliked the little rectangular paper tickets you have to use in Paris, which littered the ground at many stations. However, London was much more expensive than Paris. By the time I was ordering my first lunch in French, I was relieved by the much lower prices. The French food was better, allowing me to sample tarts, chocolate bread, crepes and other naughty carbohydrates. Paris was also home to the delicious Kit Kat McFlurry, but I never went into a British McDonalds, so it’s possible they have it too. London was home to the most amazing food halls and I probably left some drool on the glass cases there. I fell in love with Parisian coffee. They serve it on a saucer with two cure sugar cubes which I delighted to stir into my coffee. When I took my last sip, it was extra sweet, flavored with the remainder crystals. I also liked the French attitude that you should sit and enjoy a meal. I only found the lack of to-go coffee annoying because I was trying to do a lot, but I think if I lived there I would like the slower pace. Both cities are beautiful. Big Ben and Westminster Abbey are shiny and beautiful and I wanted to scoop them up to put in my pocket. Paris has quaint, winding streets with narrow sidewalks everywhere, making it very walkable. Standing at the top of the Arc de Triomphe you can see the streets spiral out, which made me appreciate how well planned Paris is. I also love how the city is painted in a consistent white, pastel color. You can walk along the river in both cities, and both have many lovely public parks to people watch in. Both cities have lots of museums, which are free in London but not Paris. When I departed from Paris, I felt like I’d left more undone than I had in London. I suppose if I had to pick a favorite, I’d go with Paris, but I would probably enjoy it more if I spoke French. A bientot! When I went to Paris for the first time, I remember telling the concierge, who was taking me to my room, that it was my first time in France. She asked, politely, if I had been anywhere else in the country or if I was planning to on this trip. When I said no, she said, ah, then I cannot say I have been to France. I have certainly been to Paris, but Paris is not France. London is not England. Meaning the capital city is nothing like the rest of the country, for better or for worse. Madrid, however, was Spain, Lisbon is Portugal, and Rome was definitely Italy. But Paris and London were unique entities in the world and should be treated as such. She was the same one who quizzed me about my travels every day and shared Parisian coffee with me one morning…a lovely Italian woman. Now to the question of London or Paris? Went there last summer and cannot wait to go back, and see the rest of Italy. It’s got the best aspects of both capitals, with some amazing scenery, remarkable food, and charming people. Loved your answer (because I posed the question). Since I live in New England, I find London familiar; Paris is “the other”, so different. It’s a city devoted to art, beauty and an elegant lifestyle. I traveled to both alone and found Paris more welcoming, which is weird cause I’m from Texas and don’t speak fluent French. But the French were very patient with my butchering of their language and were friendly for the most part. Londoners seemed more indifferent to or more removed from their surrounding or from interacting with others. Parisians seemed more laid back in attitude and took time to enjoy things. I wasn’t in either city long though, it was over 15 years ago, and I was a tourist so I’m intersted to read other’s ideas of the two cities and how they compare. Paris definitely gets my vote. I speak French, which really helps, but what I love about Paris is how visually wonderful it is. Sadly, much of London was bombed to smithereens during WW2, so there are fewer historic buildings (though there’s still a lot to see). The food in France is also vastly better than in Britain, unless you have mucho bucks. Also, as you say, the French take more time to enjoy life. I do like London, but not half as much as Paris. And Rome is pretty wonderful too! I agree with Ellen’s comment.. The countryside towns in both France and England were entirely different than the cities of Paris and London. And I too, loved Rome. But if we’re voting from all european cities, I’d have to say Florence.. beautiful, romantic and gelato (like ice cream but better!) – need I say more? haha.. So Pasta Queen, when is your next travel adventure now that you’re hooked? Never been to either, but Paris calls to me more. Wish I would have gone when I was all but fluent in french in high school/college. London is on the list for sure, but Paris definitely is that magical place I *have* to go someday. First though – Italy next year. I’ve cut the frustration: everybody on the planet seemed to be going to Paris (all three of my brothers, my boyfriend’s college, a girl friend, a teacher, some people from the government, president Obama (twice! ), you) and I live only a 3.5 hours drive away from Paris yet I’ve never been there. Never! Just to correct an error: all national musems are indeed free in Paris if you are under 26 years old. And they are also free to all ages the first Sunday of every month. having lived in both cities (although only as student in Paris), and being equally fluent in French and English I think they are both great places. 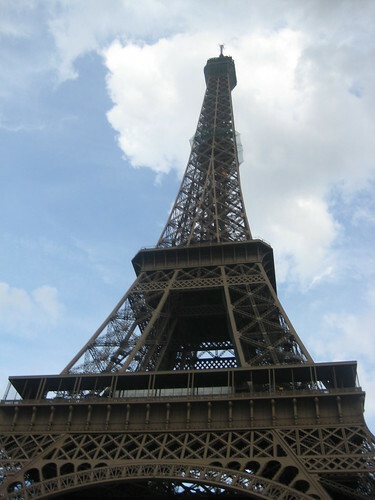 Paris is possibly more fun to vist (more compact, certainly), and London much more expensive. Ultimately London is where I chose to live (more villagey, and a bit more fun). I agree that there’s more to see in Paris than in London. I love London and have spent a lot of time there, but Paris is more of an adventure that never ends. There’s always something new to discover. Nothing, however,compares to Scotland. Such a nice place and such nice people! I’d move there in a second! I’d say London – because I live here! So, we’re pals even more now that I know you like Ben Folds. Love him.